Should you leave out a scent lure for your lost cat? Facebook is a great venue to post about your lost cat, and you can maybe get some leads on a possible sighting, or get valuable tips and resources. If you post about your lost cat on Facebook, inevitably someone will post that you should leave your cat's litter box outside so that your cat will smell it and know which way is home. Please don't. 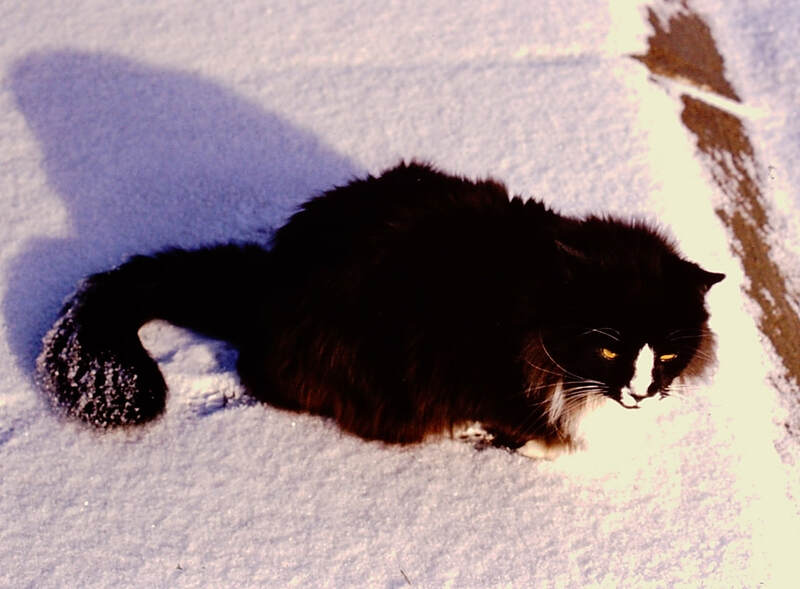 A litter box can attract unwanted attention from other cats, and one of the main reasons lost cats don't simply come home is because of territorial disputes with other cats. It is disheartening that every single post about a lost cat on Facebook is answered with this little nugget of bad advice. When I say the litter box is a bad idea, many people will say that their cat came back when they put their litter box out. That only means that your cat came back while the litter box was out, not because the litter box was out. Is there something else you can put out as a scent lure to attract your cat? If so, is there any scientific basis for this recommendation? First, let me say that putting out a scent lure is not a high priority for a lost cat. If your dog is missing, then I would definitely recommend putting out an article of your clothing at home or at the point your dog was last seen. Dogs do navigate by scent and I have strong evidence, in hundreds of cases, that a scent lure from a dog's owner is a useful tool for attracting a stray dog. Cats are far less likely to navigate by scent, in the sense of finding their way back home. The main way cats interact with scent is by establishing territories. A cat will stay away from an area where a dominant cat has left his scent. Cats also recognize the scent of their homes and their people. Mostly, cats use scent in avoiding certain areas, not navigating to something. Food. I recommend leaving food out in some cases and not others, and I can't make a general recommendation to leave out food for your lost cat. If you do leave food out, it is best to have a camera watching the food, so you know who ate it. Also, if you are setting a humane trap, then it should of course have food in it. I would not recommend a feeding station if you have one or more dominant cats that are claiming your yard as their territory. Food can also attract wild animals and predators. I would want to learn more about a particular cat's situation before I would recommend leaving food out. Clothing. In most cases, it may help, and it probably wouldn't hurt, if you put out some clothing you've worn. If you are setting a humane trap, I definitely recommend placing a shirt you've worn on the floor of the trap. Your scent is a specific lure for your cat, and it is unlikely to attract unwanted attention from other animals, such as neighborhood cats. As far as I know, there have been no scientific studies that show that lost cats are lured back home by dirty T-shirts. On the other hand, there is no evidence that the presence of your worn clothing would attract the wrong animals or keep your cat away. So, worn clothing may be an attractant for your cat, and won't attract the wrong sort of animal attention. I almost always recommend putting out worn clothing, not because it has a great chance of success, but because it at least won't make matters worse. The lost cat's bedding. Quite often, I see the recommendation of placing a cat's bedding out on the porch. This isn't necessarily a bad idea, but before you do this, you ought to consider whether or not you should preserve your cat's scent for the use of a search dog. Lost cats have been found by search dogs in some cases. In most instances, it was a cat-detection dog that was able to find the cat. In a few cases, a scent-trailing dog was able to follow the scent trail of the lost cat. If you may want to try a scent-trailing dog, then you would want to preserve something that has the scent of your lost cat. So, putting your cat's bed outside isn't a bad idea, but you might not want to do that if it is the only thing bearing the scent of your cat. Leaving it outside could contaminate it and make it useless for a search dog. If a cat is going to be attracted to the scent of his own bed, then he ought to be attracted to the scent of your worn clothing. Also, something with your cat's scent, such as a bed, may cause an intruder cat to spray it, and mark the territory as his own, which would negate the function as a lure for your cat. Putting out your cat's bed isn't a terrible idea, but I still wouldn't recommend it in most cases. Urine. Many sources on the internet recommend that you urinate in a spray bottle and then spray your own urine in your yard and around the neighborhood, to help your cat come home. This is nonsense, for a number of reasons. While many people will claim that they did it and it worked, they would have no way of proving that their cats came home because of the urine sprayed around. The most they could say is that their cat did come home after the urine was sprayed, not because of it. Further, your cat would definitely recognize your personal scent, in most circumstances. Everywhere you walk, you deposit your scent whether you want to or not. This is the reason fugitives and missing persons can be tracked by trained dogs: a human leaves her scent everywhere she goes. As you walk around the neighborhood looking for your cat, you will be depositing your scent, which is great. No need to spray any urine. Sprays and liquids from the pet store. Some, such as Bach Flower Remedies, are just nonsense. Others, based on chemical analysis of actual feline pheromones, may have some logical basis for having an effect. However, to date their has been no clear scientific evidence that these products have any effect at all. I would not recommend anything of this nature. In conclusion: Don't spray urine, don't leave out the litter box, leave food in some cases, don't put your cat's bed on the porch, and no Feliway or similar sprays. Go ahead and leave your worn clothing out because it may work, and it shouldn't hurt anything. It is not a high priority, and there are many other effective ways of finding a lost cat which should be a higher priority. People will keep recommending the litter box and spraying urine because they want to be helpful and because these seem like quick and easy ways to get your cat back. I wish there was a way to stop these memes, but all I can do is try to get accurate information out there. The truth is often more complex than these quick and easy memes, and so it doesn't get shared as readily.